"Zealot" and "Zealous" redirect here. For other uses, see Zealot (disambiguation) and Zeal (disambiguation). The Zealots were originally a political movement in 1st century Second Temple Judaism which sought to incite the people of Judaea Province to rebel against the Roman Empire and expel it from the Holy Land by force of arms, most notably during the First Jewish–Roman War (66-70). Zealotry was the term used by Josephus for a "fourth sect" during this period. The term "zealot", in Hebrew kanai (קנאי, frequently used in plural form, קנאים (kana'im)), means one who is zealous on behalf of God. The term derives from Greek ζηλωτής (zelotes), "emulator, zealous admirer or follower". Judah of Gaulanitis is regarded as the founder of the Zealots, who are identified as the proponents of the Fourth Philosophy. In the original sources, however, no such identification is anywhere clearly made, and the question is hardly raised of the relationship between the Sicarii, the upholders of the Fourth Philosophy, and the Zealots. Josephus himself in his general survey of the various groups of freedom fighters (War 7:268–70) enumerates the Sicarii first, whereas he mentions the Zealots last. Others have also argued that the group was not so clearly marked out (before the first war of 66-70/3) as some have thought. 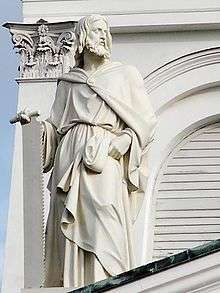 Simon the Zealot was listed among the apostles selected by Jesus in the Gospel of Luke and in the Acts of the Apostles. Two of Judas' the Galilean's sons, Jacob and Simon, were involved in a revolt and were executed by Tiberius Alexander, the procurator of Iudaea province from 46 to 48. The Zealots had the leading role in the First Jewish–Roman War (66–73 CE). The Zealots objected to Roman rule and violently sought to eradicate it by generally targeting Romans and Greeks. Another group, likely related, were the Sicarii, who raided Jewish habitations and killed Jews they considered apostate and collaborators, while also urging Jews to fight Romans and other Jews for the cause. Josephus paints a very bleak picture of their activities as they instituted what he characterized as a murderous "reign of terror" prior to the Jewish Temple's destruction. According to Josephus, the Zealots followed John of Gischala, who had fought the Romans in Galilee, escaped, came to Jerusalem, and then inspired the locals to a fanatical position that led to the Temple's destruction. They succeeded in taking over Jerusalem, and held it until 70, when the son of Roman Emperor Vespasian, Titus, retook the city and destroyed Herod's Temple during the destruction of Jerusalem. In the Talmud, the Zealots are the non-religious (not following the religious leaders), and are also called the Biryonim (בריונים) meaning "boorish", "wild", or "ruffians", and are condemned for their aggression, their unwillingness to compromise to save the survivors of besieged Jerusalem, and their blind militarism against the Rabbis' opinion to seek treaties for peace. However, according to one body of tradition, the Rabbis initially supported the revolt up until the Zealots initiated a civil war, at which point all hope of resisting the Romans was deemed impossible. The Zealots are further blamed for having contributed to the demise of Jerusalem and the Second Temple, and of ensuring Rome's retributions and stranglehold on Judea. According to the Babylonian Talmud, Gittin:56b, the Biryonim destroyed decades' worth of food and firewood in besieged Jerusalem to force the Jews to fight the Romans out of desperation. This event directly led to the escape of Johanan ben Zakai out of Jerusalem, who met Vespasian, a meeting which led to the foundation of the Academy of Jamnia which produced the Mishnah which led to the survival of rabbinical Judaism. The Zealots advocated violence against the Romans, their Jewish collaborators, and the Sadducees, by raiding for provisions and other activities to aid their cause. One particularly extreme group, perhaps a subgroup of the Zealots, was known in Latin as sicarii, meaning "violent men" or "dagger men" (sing. sicarius, possibly a morphological reanalysis), because of their policy of killing Jews opposed to their call for war against Rome. Perhaps many Zealots were sicarii simultaneously, and they may be the biryonim of the Talmud that were feared even by the Jewish sages of the Mishnah. According to historian H.H. Ben-Sasson, the Sicarii, originally based in Galilee, "were fighting for a social revolution, while the Jerusalem Zealots placed less stress on the social aspect" and the Sicarii "never attached themselves to one particular family and never proclaimed any of their leaders king". Both groups objected to the way the priestly families were running the Temple. Taking the Greek word zelotes in Acts 22:3 and Galatians 1:14 of the New Testament to mean a 'Zealot' with capital Z (the earliest Greek manuscripts are uncials or all capital letters), an article by Mark R. Fairchild suggests that Paul the Apostle may have been a Zealot, which might have been the driving force behind his persecution of the Christians (see stoning of Saint Stephen) before his conversion to Christianity, and his incident at Antioch even after his conversion. While most English translations of the Bible render this Greek word as the adjective "zealous", the word is a noun meaning 'adherent, loyalist, enthusiast; patriot, zealot'. A 'Zealot' with capital Z, however, would suggest a member of the particular Zealots, the group that emerged in Jerusalem ca. AD 6 according to Josephus, see above. In the two cited verses Paul literally declares himself as one who is loyal to God, or an ardent observer of the Law, but the relationship of Paul of Tarsus and Judaism is still debated. This does not necessarily prove Paul was revealing himself as a Zealot. A translation (the Modern King James Version of Jay P. Green) renders it as 'a zealous one'. Two modern translations (Jewish New Testament and Alternate Literal Translation) render it as 'a zealot'. The Unvarnished New Testament (1991) renders Galatians 1:14 as "...being an absolute zealot for the traditions...". These translations may not be inaccurate, but it is disputed by those who claim it gives the wrong association with the "Zealots". ↑ "Josephus, Antiquities Book XVIII". ↑ Richard Horsley's "Bandits, Prophets, and Messiahs" and Tom Wright's "The New Testament and the People of God"
↑ Neusner, Jacob (1962). "6". A Life of Rabban Yohanan Ben Zakkai: Ca. I-80 C.E. E.J. Brill. ISBN 978-9004021389. ↑ Solomon Schechter, Wilhelm Bacher. "Johanan B. Zakkai". Jewish Encyclopedia. ↑ Sorek, Susan (2008). The Jews Against Rome: War in Palestine AD 66-73. Bloomsbury Publishing. p. 98. ISBN 9781847252487. Look up zealot in Wiktionary, the free dictionary. Look up zealotry in Wiktionary, the free dictionary. Smith, Sydney F. (1913). "Zeal". Catholic Encyclopedia. "Zealot". New International Encyclopedia. 1905.